This antique colonial farmhouse at 166 Roseville Road provides a "private oasis" for its residents with a heated Gunite in-ground pool in the rear yard and a court yard with bluestone patio in the front yard. Set back from the main road, barely visible to motorists, is an antique colonial farmhouse at 166 Roseville Road in Westport created in such a way that it provides a private oasis. There is a heated Gunite in-ground pool in the rear yard and a courtyard with a bluestone patio in the front yard. The all-season sunroom, which sits between the kitchen and first floor master bedroom suite, provides access to the pool area, and the courtyard can be accessed from the formal dining room as well as the master suite. While Roseville is a well-traveled road, the property abuts Diamond Hill Lane, a very quiet, secluded cul-de-sac. There are two entrances for the driveway, one from Roseville Road and another from Diamond Hill Lane. 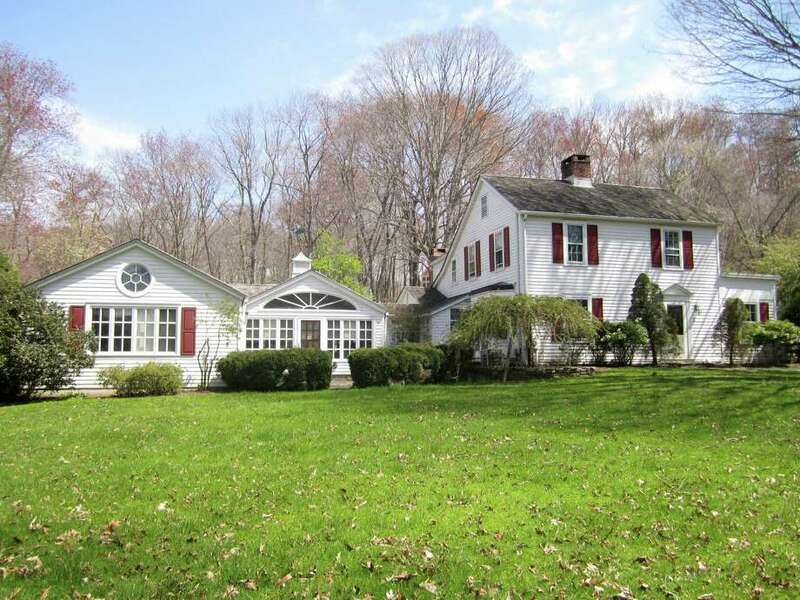 The location of this house makes it convenient to the Merritt Parkway and Route 1, Post Road, and less than ten minutes to downtown Westport and I-95. The main house was built in 1840 and it has 3,483 square feet of living space. It sits on a 1.22-acre property with slightly sloped and level areas. The three-car detached garage was built in 1955 with a guest house/apartment above it. This legally rentable space has two rooms comprising 875 square feet of living space and includes a kitchenette. It has forced-air oil heat, window boxes and a new cedar-shingle roof. In addition to room for three vehicles, the garage also has storage for yard equipment. There is a second detached one-car garage which contains a workshop. The long paved driveway lined in Belgian block leads to the two garages and ample parking spaces for those times when the home owners want to entertain guests. The driveway entrance from Roseville is marked by two stone columns. Inside the main house, there is a good size living room with a fireplace, built-in bookshelves and a Dutch door to the front yard and a multi-paned glass door to the side yard. The staircase to the second floor is hidden behind a wall in the living room. The cook's kitchen has a center island topped in granite, as are the counters. This room also features glass front cabinets, a ceramic tile backsplash, wood floor and a Kenmore Elite five-burner range. There are no walls or doors separating the kitchen and family room, which could also double as an extra-large breakfast room. It has two skylights and the second of the home's two working fireplaces. It's not only the property that enjoys privacy. The master bedroom is separated from the main living quarters with that sunroom as an additional buffer. The sunroom and master have cathedral ceilings. In the master there are also exposed beams and a skylight. The master bath has gray ceramic tile counters on the two vanities, a walk-in shower and jetted tub. On the first floor, there is a second bedroom behind the living room. It has wall-to-wall carpeting. Upstairs, there are three more bedrooms and two full baths. One of the bedrooms is en suite. Attic storage can be accessed from two places -- a hallway and one of the bedrooms. There are two separate septic systems, one for the main house and another for the legal apartment above the garage. For more information or to set up an appointment to see the house, text or call Jennifer Schwartz of the Higgins Group Real Estate at 203-216-0715 or email her at jenpalschwartz@yahoo.com.